Supercritical solutions are studied from the thermodynamic point of view by giving a comprehensive review of phase equilibrium of binary systems. The numerical modeling of the phase behavior is an approach used by several authors to describe and analyze supercritical applications. The thermodynamic equilibrium models are employed to determine the interaction coefficient between the solvent and the solute. Depending on the nature of the compound and the operating conditions three different experimental methods are used. Understanding the phase equilibrium of supercritical solutions and deeper knowledge of the supercritical fluids are needed for industrial applications such as powder elaboration by rapid expansion of supercritical solution and essential oil extraction processes. ISNAD Ksibi, Hatem . "The Solvent-Solute Interaction in Supercritical Solution at Equilibrium: Modeling and Related Industrial Applications". 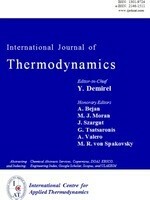 International Journal of Thermodynamics 7 / 3 (September 2004): 131-140.